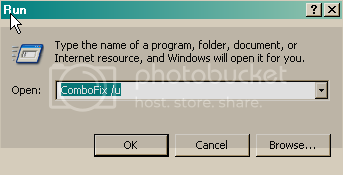 Can I remove HijackThis and ComboFix, etc from the computer? I'll check into the speeding up, but the computer's not really old -- but hey, it might help. Yes, you can delete HiJack This. Here are instructions for removing ComboFix. [*] Reset the clock settings. [*] Hide file extensions, if required. [*] Hide System/Hidden files, if required. What do I do about those? Can you please post a log from PC-cillin. If you do not know how to do that, please refer to it's help file (press F1 while in the program). I don't know which you wanted -- this was the internet security log, so I was not sure if you needed the others. Both of those take advantage of an exploit in Word 2000. Visit Office Updates and click on the botton for Check for Updates. Install all updates that it says need to be installed.